If the tailgate can no longer be opened from outside the vehicle, use the emergency release on the inside of the tailgate. ■ Take the mechanical key out of the SmartKey . ■ Insert mechanical key 2 into the opening in paneling 1. ■ Turn mechanical key 2 90° clockwise. 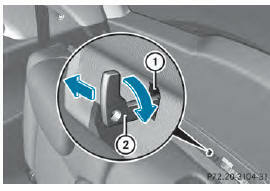 ■ Push mechanical key 2 in the direction of the arrow and open the tailgate.